From feathered fun to fantastical beasts, Leeds Museums & Galleries are sure to guarantee a fun packed programme of events for February half term. Head over to Abbey House Museum for vile Victorian crafts, morbid murder mysteries and silly science experiments inspired by the era. For drizzly day hide-aways be sure to check out Mystery Matinees at Leeds Industrial Museum. Their 1920s Palace Picture House can seat up to 25 guests and family tickets are priced at just £9. Be sure to check out their intimate screenings of family favourites and vintage classics. Lotherton and Kirkstall Abbey are getting a feathery make-over. Celebrate the start of spring with Lotherton’s Love Bird event including wildlife themed crafts, the Lovebirds trail and keeper talks. Speaking of feathered friends, there’s also daily feeds with the penguins at 11.30am. If you fancy doing a good deed for our nesting neighbours then head over to Kirkstall Abbey and help out with crafting bird feeders from natural materials collected from the grounds. At Leeds Discovery Centre there’s behind the scenes tours of their artefact store, filled with over one million objects from across the globe and millennia. If you fancy delving a little deeper then discover the mysterious world of molluscs at their family-friendly workshop on 20 February. Elsewhere there’s loads of lovely activities lined-up at Leeds City Museum with drop-in sessions and workshops inspired by their Michael Morpurgo exhibition. If you’re feeling extra creative then join them for a puppet making workshop led by a real-life professional puppeteer! At Temple Newsam there are tours galore, dressing up, crafts and storytelling and sunflower seed planting at the Stow House on 20 February. Plant your seed and take it away to watch it grow at home. 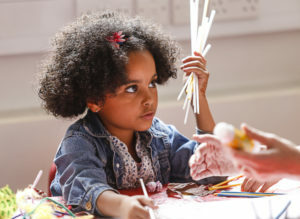 There’s more messy family fun at Leeds Art Gallery’s Artspace and Creative Tuesdays and Experimental Thursdays over at Thwaite Watermill.